To the trees do not interfere with each other to develop and didn't work one of the basic rules of nature: survival of the one who is more strong and tough, you need to maintain between them a distance that is optimal for the species and varieties. There are rules in a group tree planting and line planting. The most important rule when planting trees is to consider the capacity of their root system and crown size, which will be formed in the future and on the basis of these calculations to withstand between plants the proper distance. What distance is optimal in group plantings? 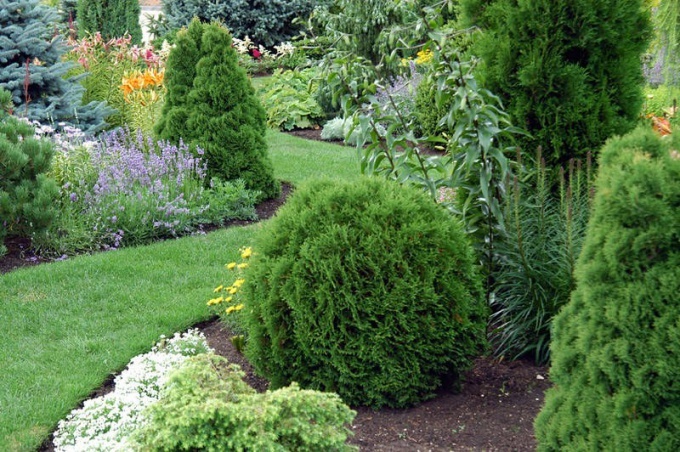 If you planted a group of trees, each of them need to provide an area of not less than 10 m2. Therefore, to ensure that the design of the site was the most successful, it is recommended on a piece of paper to make a plan in which you specify all the desired distances from one plant to another. Before proceeding to the planting site, you need to consider one peculiarity: too rare landing is fraught with the fact that the trees mostly grow low, their trunks are bent, and the creation of a special "forest"
Special attention should be paid to what sort is a tree. For example, the columnar Apple tree would be great to develop in those conditions, when neighboring trees are not more than 2 meters. For Antonovka will be much more comfortable with a greater distance: 8 to 10 m. If planted dwarf Apple trees on dwarf, two, between them it is necessary to leave not less than 2.5 meters, and between the rows – not less than 4. Vigorous varieties will not interfere with each other to develop in a case if between the plants is 5-6 m. such Apple a powerful root system, it is important to consider that the roots of the trees intertwined with each other. When landing a solid array according to the type of parkland taken to adhere to the following rules: the number of seedlings per 1 ha should be 1-1,5 thousand depending on the height of an adult tree and the power of its root system. The average distance between neighboring trees in a forest will be 2.5-3 m.
If you are planting an open alley, the optimal distance between plants is 5-12 m. This will allow the crown of each tree to develop freely, not bound up with neighbouring. For private alleys is characterized by the formation of the arch, therefore, between the plants leave a much smaller distance – 1.5 to 2.5 m.